This keynote was delivered today at the Irish Learning Technology Association's annual conference, EdTech2016, in Dublin. The full slidedeck is available here. When I was first approached about speaking to you here today, I was immediately intrigued by the provocations packed into the conference’s theme: “Reconstituting Technology-Enhanced Learning: Rising to the Challenge.” And as I’ve stewed about how to offer you some provocations in return – that is the job, I believe, of the keynote speaker: not to comfort but to provoke – I’ve used this phrase as the starting point for my own thinking. “To reconstitute” is to re-form an organization or a group in a new way. To re-establish order. To devise new rules. To settle upon new governance. “To reconstitute” is a political and legal act. I’m not sure we talk often enough about technology-enhanced learning in these terms – as a political not merely pedagogical practice. Certainly we address “policies” – we often have no choice – but less often do we really dig into “politics” and even less often into the ideologies of education technologies. Education technologies – and technologies more broadly – are typically seen as politically neutral and ideology-free. All this makes it imperative for us to ask – in the formulation of this conference theme, certainly, but obviously well beyond this event – who is reconstituting technology-enhanced learning. Who are the subjects, the actors, the decision-makers, the participants in this political act? Who determines what these “new rules” of education technology might be? What sorts of agency, what sorts of “say,” what sorts of control do we have? That pronoun “we,” of course, is used in turn both broadly and narrowly, to include and exclude. “We” reconstitute; “we” are reconstituted – that difference too is an issue not just of language but of politics, of power. Our “constitution” is another word for our bodies, our health. Which bodies, whose bodies are the “we” that would reconstitute ed-tech? What sort of health – of our bodies, our systems – are we really working towards? 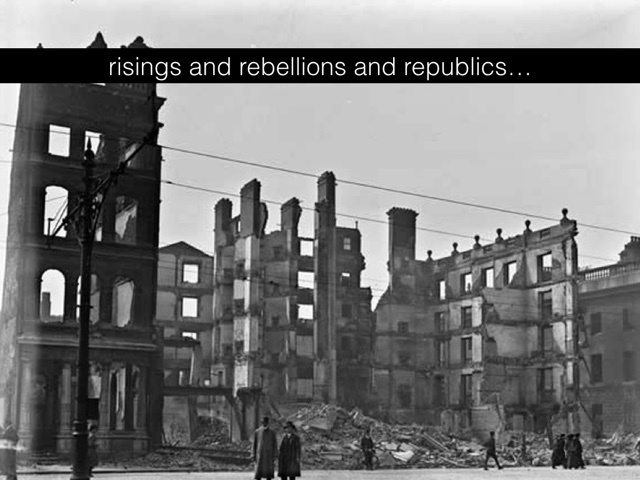 Rebellions and republics – on our minds because of historic events from the past, on our minds because of historic events of the present and the future. Indeed, I can’t go anywhere these days – inside or outside the US, on- or offline – without hearing panicky questions and proclamations about November 2016, the upcoming Presidential Election, and what the hell is going on with Donald Trump. Rebellions and republics – I thought briefly about calling this talk “The Terrible Beauty of Ed-Tech,” a reference to W. B. Yeats’ poem “Easter, 1916,” of course – but opted, thanks to Donald Trump, to invoke a different, more apocalyptic Yeats. So the title of this talk is “The Rough Beasts of Ed-Tech” instead. I’ve written two books about “the monsters of ed-tech” and certainly the “rough beasts” could be their kin. 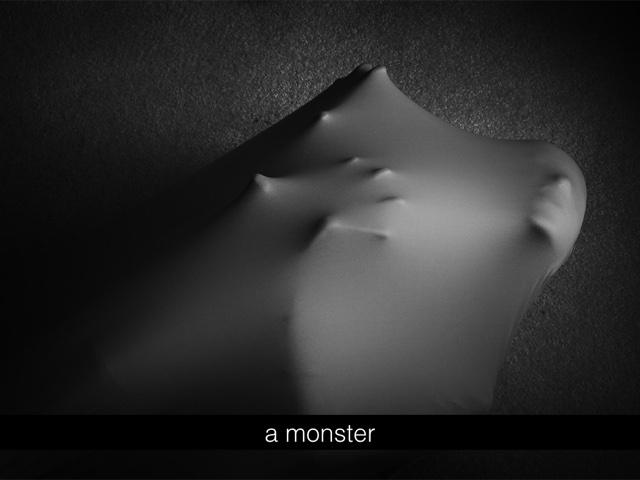 These beasts and monsters share a certain genealogy of imagination – the monstrous and the marvelous that populate our cautionary tales and our fantasies about the past, present, and future, about science and technology and our relationship to it, about the dangers of a malformed and misshapen transformation, a transformation intertwined with that most fearful and hopeful question about the future, one that’s expressly tied to the institution and to the practice of education: what will we become? I’ve argued elsewhere that that most famous monster, Victor Frankenstein’s creation, is of particular significance for our work in education technology and not simply because it is the classic, cautionary tale of science gone awry. I want us to recognize, to remember: Frankenstein’s monster became monstrous because he was abandoned by his maker, because his maker failed to educate him. The creature became a monster because Frankenstein rejected him; he did not love him. I’m drawing on the work of Bruno Latour to make this point, I should note: I believe we must care for our technological creations. We must develop them respectfully, lovingly. We must be involved – intellectually and politically – in their creation and in their growth. We are responsible. The work of Victor Frankenstein produced a hideous body, a failed constitution – not only a failed scientific creation but a failed social contract with the creature. If we are to reconstitute our educational, technological creations, we must do so with infinitely more ethics and care. 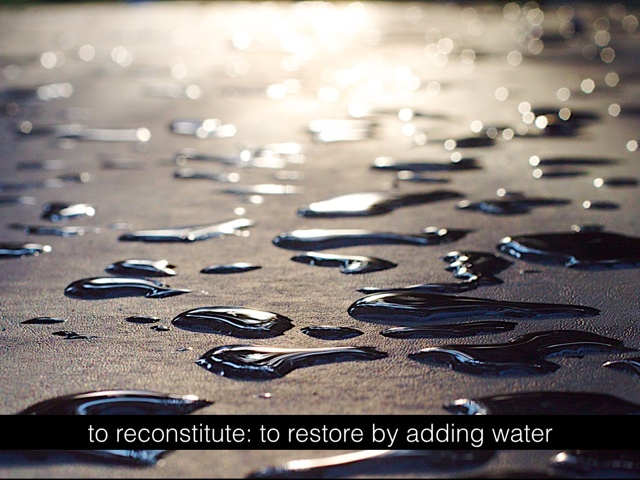 “To reconstitute” also means, of course, to restore something to its original form by adding water. And for me, that immediately conjures up the image of the Sea Monkey, quite a different sort of monster. I’m not certain if Sea Monkeys are or were “a thing” here in Ireland – so perhaps it’s a risk to center my arguments here today on this gimmick – but the Sea Monkeys were very much part of my childhood in the US in the 1970s and 1980s. Or I longed for them to be, I should say. They were part of my childhood imagination – good monsters, if you will. 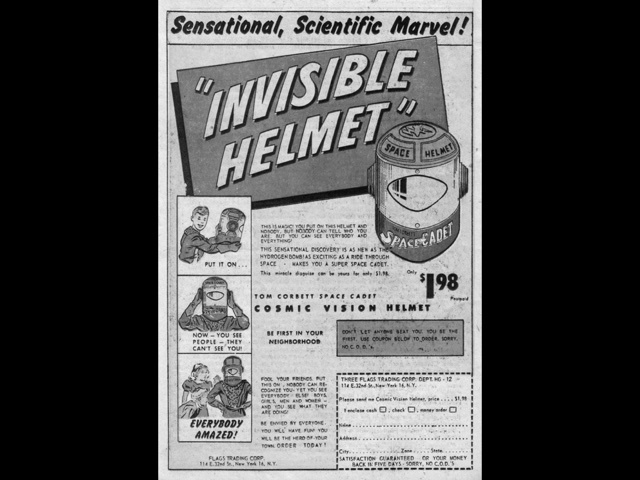 Ads for these creatures appeared in the back of comic books, alongside a number of other products promising similar sorts of scientific amazement and technological trickery. Comic books themselves were frowned upon by my parents. But my dad ran a little grocery store, and when I’d visit him at work, I’d crouch by the magazine rack and surreptitiously flip my way through as many as possible. The comics beckoned to me with their colorful contents, with their superhero/supernatural tales, with what I felt was some subversive or elicit knowledge. I bet Victor Frankenstein, whose own father had carelessly dismissed his son’s interests in the study of alchemy, would have understood their appeal, and he too would have been curious about what great powers the ads in the back pages of comics guaranteed. 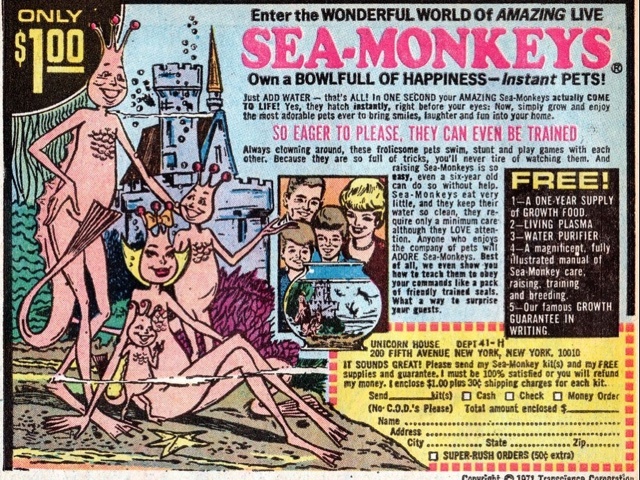 As I child, I didn’t quite catch the nuance of that last sentence – what the verbs “appear” and “seem” were really saying about the Sea Monkeys. I pleaded with my parents to let me order some by mail. Starting your own Sea Monkey colony involved a careful two-day process of following instructions, a careful two-day process of reconstitution. First, you’d add water and a special Water Purifier package to your aquarium. It wasn’t labeled as such, but this purification package also contained Artemia NYOS eggs, a specially hybridized species of brine shrimp (hybridized not only to be able to survive the mail order experience but to be reanimated with real flair – a burst of Sea Monkey creation that was “Instant Life,” as the product was first called before being rebranded as “Sea Monkeys”). After 24 hours, you’d add the Instant Life Eggs package, which contained more eggs, along with yeast, borax, soda, and salt, and (sometimes) dye. The Sea Monkeys that seemed to then appear instantaneously had actually been growing since the Water Purifier package was added the day before. Once the Sea Monkeys emerged, you were directed to add Growth Food – yeast and spirulina – to the water every five days. Hopefully they lived that long. “They’re brine shrimp,” my father explained to me when I begged him to let me order some, destroying the image I had in my head that these were little cartoon mermaids and mermen and mer-families. My father was a bit of an amateur fish breeder himself, and half a dozen aquariums lined the walls our basement. I imagined that my Sea Monkeys would be far more intriguing than some of the fish that he collected – even more intriguing than the mouth-brooding cichlids, which, even as boring a pet as I thought fish were, were pretty cool. After all, the ad said that Sea Monkeys could “swim, play scoot, race and do comical tricks and stunts,” and I imagined that I could train them. “Sea Monkeys are just brine shrimp,” my dad repeated as he broke off a chunk of frozen brine shrimp that he’d bought at the local pet store and fed it in turn to his sea anemone. There’s just enough truth in a humbug – there’s just enough truth to the Sea Monkeys, arguably – that we prefer it to the less ornate, less exciting, less imaginative realm of “reality.” We want to be entertained. We want wonder and amazement. We prefer the fiction to the facts. We don’t really really believe, but we believe enough (or we care little enough to bother with objecting to something’s veracity). Once you see this connection – whether it’s real or imagined, Trump wants you to believe the connection – and recognize this cultural impulse (and I don’t think it’s solely an American one) perhaps you might realize how high the stakes can be with the hype and hope surrounding stardom and science (or more accurately, pseudoscience). Suddenly it’s not merely a matter of parlor tricks; it’s the presidency. It’s also a matter of a $40 million civil suit against Trump University, a business that Donald Trump and two associates founded in 2004. 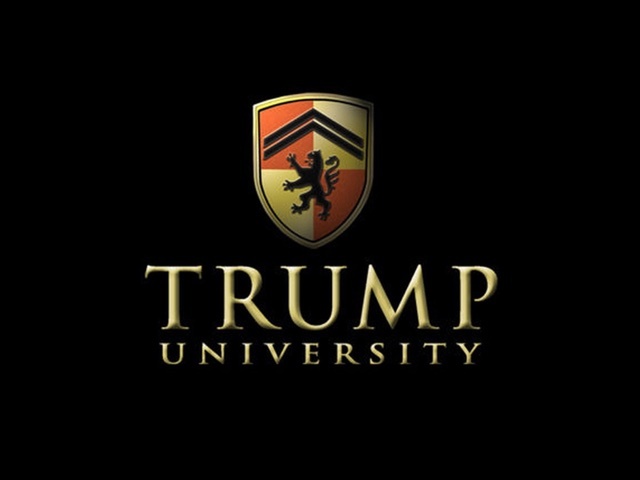 Trump University was never an accredited university. It offered no college credits, no college degrees. But it did offer courses in real estate, entrepreneurship, and wealth management via, yes, technology-enhanced learning – that is, via Web-based courses. From the very outset, Trump University was warned that it was violating the law by using the word “university” in its name. And in 2013, the New York State attorney general filed suit against the business, which had shut its doors two years earlier, accusing it of engaging in illegal, deceptive practices. These legal charges included running an unlicensed school, making false claims about the classes, and intentionally misleading some 5000 students with promises they’d learn Trump’s real estate investment techniques. The case is ongoing, although it’s unlikely it will be heard in court before the November presidential election. The entry point for students into Trump University was a free 90-minute seminar, which continued into a 3-day seminar that cost $1500. Each course promised that more information – the bigger secrets of Trump’s moneymaking success – would be revealed in the subsequent course. Trump University involved a perpetual up-sell, and students were urged to continue to enroll, to continue to pay. Just call your credit card company and ask for an extension on your line of credit, instructors purportedly told students. Doing so will even raise your credit score. The $1500 seminars led in turn to the “Trump Gold Elite” package, which promised personal mentorship from instructors “handpicked by Trump.” The price tag for that: $35,000. According to the New York State attorney general, these instructors were not handpicked by Trump; Trump did not participate in developing any of the curriculum. Despite his name on the “university,” students never got to meet Trump (some apparently thought that was part of the deal), although they did have the opportunity to pose for a photo next to a life-size cardboard cut-out of him. An honest man who arrests public attention will be called a “humbug,” but he is not a swindler or an impostor. 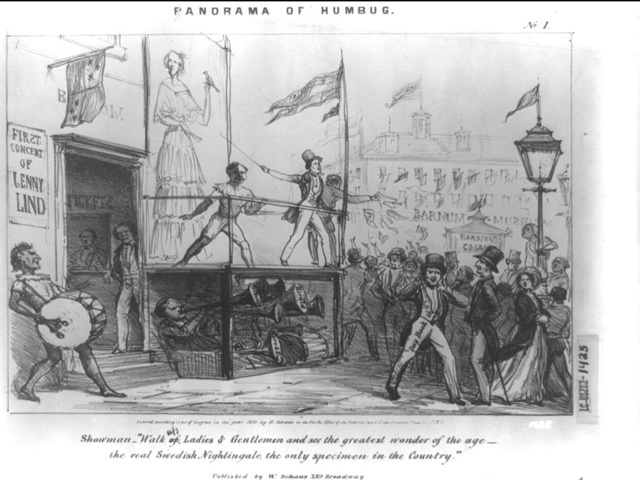 If, however, after attracting crowds of customers by his unique displays, a man foolishly fails to give them a full equivalent for their money, they never patronize him a second time, but they very properly denounce him as a swindler, a cheat, an impostor; they do not, however, call him a “humbug.” He fails, not because he advertises his wares in an outre manner, but because, after attracting crowds of patrons, he stupidly and wickedly cheats them. 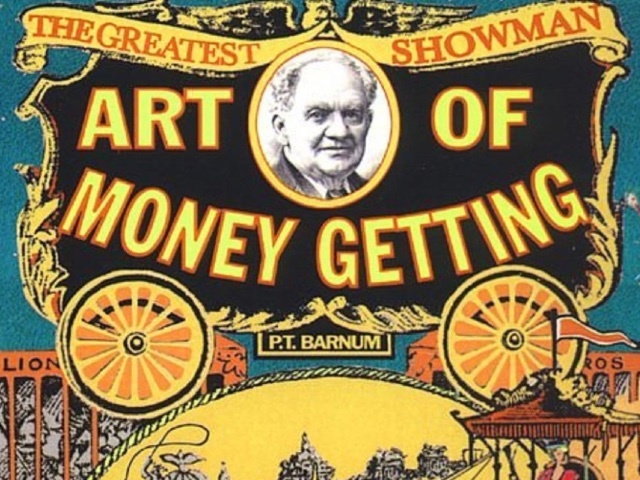 Perhaps there’s simply a difference between spending a dollar for admission to one of Barnum’s exhibitions to see a creature that turns out to not really be a mermaid or spending a dollar for a mail order Sea Monkey family that turns out to actually be brine shrimp and spending $35,000 for a real estate seminar that turns out to not be taught by a famous real estate mogul. Perhaps there’s simply a difference between being urged to buy one product that doesn’t quite work as labeled and being urged to keep buying a series of them, with the promise that with the next update (or the next feature release or the next course in the sequence) all the bugs will be worked out, all the secrets will be revealed. Or perhaps there’s simply a difference between a promise of entertainment and a promise of education. We have expectations – differing expectations – about the quality of both, but we have regulations specifically to address the latter. 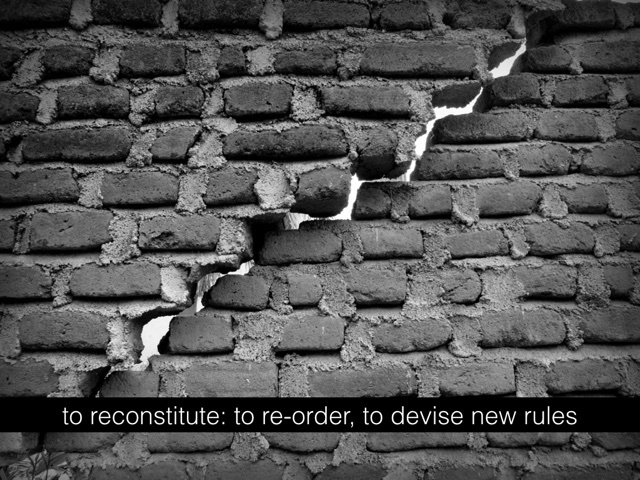 To “reconstitute,” remember, means to devise new regulations, new rules. As we – again, who is this “we” – “reconstitute” education and technology-enhanced education in the face of challenges to changing labor markets, in the face of challenges to the accreditation system, in the face of challenges to institutions of education themselves, we must ask about the politics and ideologies that underlie the old rules and potential new ones as well. Those of us who work in education need to grapple with the questions raised specifically by Trump University too, because the business employed some highly reputable learning scientists, including former Yale University artificial intelligence professor Roger Schank. Indeed, my friend Mike Caulfield, who now works at Washington State University and who worked for Schank’s company Cognitive Arts in the early 2000s, recently argued that Trump University’s online courses were well designed – probably better designed than those offered by most universities today, certainly better designed that the venture capital-backed MOOCs. And that contention raises some serious issues for all the ed-tech equivalents to the ads in the back of our industry’s comic books. 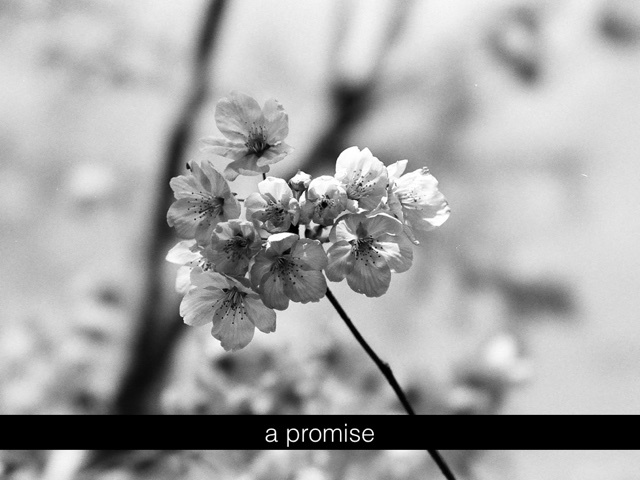 What are we promising? What else is really a humbug? What else might be a fraud? What are MOOCs, for example? What are virtual learning environments? What is virtual reality? What is artificial intelligence? (Recall that the original “Mechanical Turk” – that is, not the microtask marketplace offered by Amazon – was a parlor trick, supposedly an intelligent chess-playing machine but actually a hoax with a human hiding inside.) 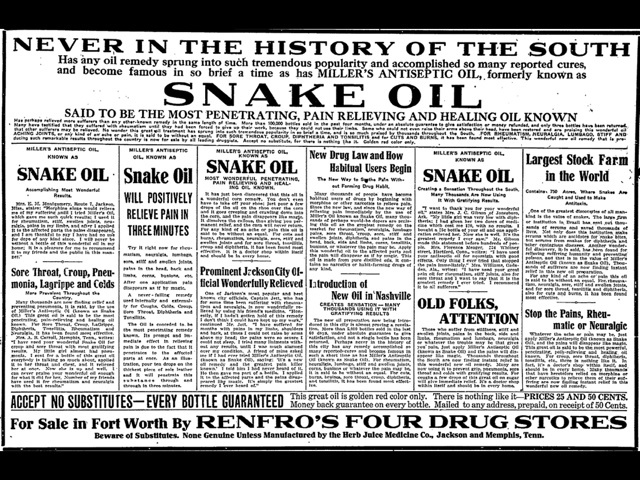 What is “adaptive learning” (something that Mindwire Consulting’s Michael Feldstein has already suggested features its share of “snake oil” salesmen)? How much of ed-tech is humbug? How much might be fraud? These questions get at what is an uncomfortable and largely unspoken truth about education. That is, education, for its own part, makes all sorts of claims – sometimes, let’s be honest, fairly wild and unsubstantiated claims – about amazement, achievement, and transformation. These promises may well reveal that our field is full of Sea Monkeys – colorful promises of becoming that we might not actually be able to or even intend to honor. 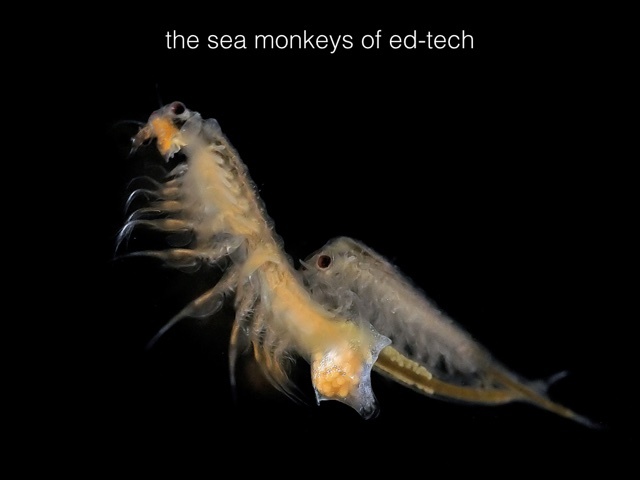 As we reconstitute technology-enhanced learning, are we simply reconstituting Sea Monkeys? Sea Monkeys, unlike my framing of ed-tech’s monsters, do – at least according to the instructions that accompany them – require that we care for them. Or at least, the process of reconstitution requires we follow the rules if we want Sea Monkeys and not an empty, lifeless fish bowl. Here is where the “rough beasts of ed-tech” probably differ. To restate: we must care for our monsters in order to thwart their monstrosity. Here we come back to the verb “reconstituting” in the conference theme – “reconstituting technology-enhanced learning” – and its demands too that we see our work in ed-tech as an ethical act, as a political act – as an act, as a responsibility. It’s more than “just add water” and watch or walk away. There’s nothing we can do, in some stories I hear told about education technology and technology in general, now that computers are loosed upon the world. There’s nothing we can do, in some stories I hear told about Donald Trump, now that fascism has been loosed upon the world. We’ve taken a humbug – not quite the truth, not quite a lie, not quite important enough to litigate over – and elevated it to mythology – an inscrutability, a sacred truth. Technology is moving faster than ever before, we’re told. “The centre cannot hold.” Technology is inevitable, we’re told. “Disruptive innovation” is inevitable. 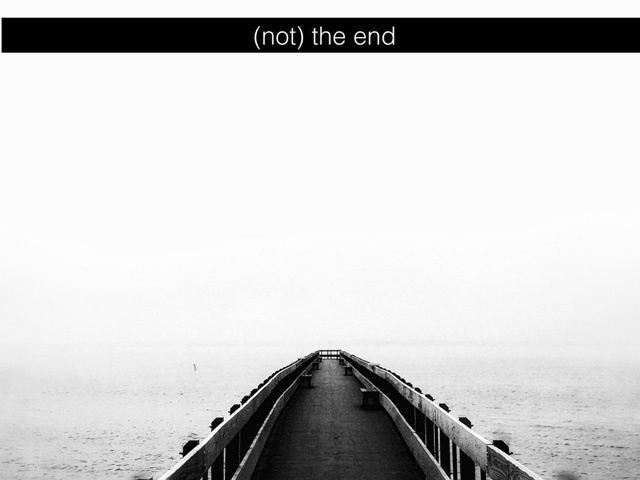 The end is near – the end of higher education, public education, work, the EU, the liberal arts, the humanities, poetry. Everything will be swept aside by the rough beasts, the rough beasts of technology, the rough beasts of education technology. It is out of our hands. We have – with Trump and with Frankenstein’s monster and with Sea Monkeys and with education technology – a choice. We can act. We can reconstitute (and not simply hand over the “reconstituting” to god or to venture capitalists or to technology company CEOs or to whomever). We can rise and must to the challenge. I’ve embraced – a bit jokingly, a bit seriously – the label that someone once called me: “ed-tech’s Cassandra.” But to be clear, this is literary allusion; I was not cursed by a Greek god with the ability to see the future only to be unable to convince my people of impending doom. I’m not even in the business of making predictions. I do look closely at trends, sure, and at stories, and at the trajectories that particular groups and decisions seem to set us upon. But even as “ed-tech’s Cassandra,” I do not believe that the doom, the monstrosity is pre-ordained. We can look closely at the juxtapositions that we appear to be offered here in these various narratives about science and technology and education and transformation: the juxtapositions between republics and revolution, between birth and rebirth, between apocalypse and salvation, between progress and bloodshed, between order and disorder, between marketing and science, between humbug and fraud, between and among and within and beyond the stories we tell one another about the past and the present and the future. We can decide to tell different stories. But we must act. Our reconstitution of ed-tech must be a political act. 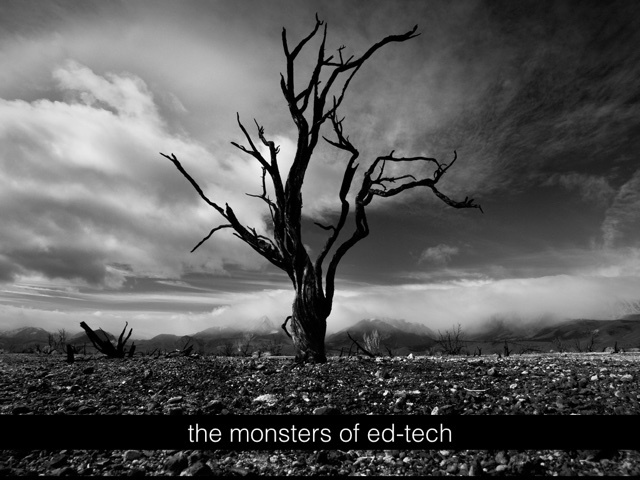 There are monsters looming in education technology. (There are monsters looming in politics.) We created them. As we reconstitute technology-enhanced learning, let’s have a purpose and a politics that negates and undoes their monstrosity, that works with great urgency to deny them the power of becoming these “rough beasts” which we’re told are poised to overrun us all.